Welcome to the Campaigns section. Campaigns are pre-designed Dungeon decks with designated Quests. These Campaigns require using specific cards to play, and assume you have the full set. If you do not have all of the cards you can substitute what you like. Select your game mode from the below options and the link will open a pdf file. To make campaign mode more difficult, try using the same Crawler deck through each segment of the entire storyline. Change out only 4 cards between any given segment. Single Set will require only 1 Unbound Starter and 1 of each Delve Pack. Maximum will contain up to 4 of any 1 Rare or Uncommon card (and 4-8 Common and Infrequent cards) which means that you will need 4 copies of the Starter and Delve Packs in order to have enough of the rare cards for the builds. Cooperative will allow for 2-4 players. This will require up to 4 of each rare, which means 4 copies of certain cards. If all 4 players has a set, there should be enough cards to fill out the Co-op Campaigns. Make your own campaigns and share them with our community on the forums. Want to add a whole new level of difficulty and excitement to your crawling experience! Wild Card Scenarios is a new way to add that extra level of randomness to your encounters. It's pretty easy. First choose one of the scenarios below and each Round as a Combat Trigger, flip a token (we use the Spent token), if it comes up "Spent" (or anything other than the number side) play out the scenario listed below. There are two rules you'll need to know; Target X and Effect X.
Refresher: "Target X" is equal to the Cost of the top Dungeon card in the Grave +1. So if the Goblin is the top card that = 0 +1 for a total of 1. If your Adventurer in spot #1 is the Primary Target, they will remain the target. If Target X is higher you count to the right starting with the Primary Target until you get to the Adventurer furthest to the right then begin again at the furthest left Adventurer. New Rule: "Effect X" is equal to the Cost of the top Dungeon card in the Grave +1. Refer to the effect listed (if there are multiples) in the list. Activate and Lock Adventurer using Target X. Each Terrain card in play grants +1 Power to each Character. Characters and Adventurers with Stealth gain +4 Power. Place a poison token on target Adventurer. 1. Goblins & Spiders gain +1 Armour and +4 Power. 2. Lamia & Slaugh gain Stealth. 3. Vodyanoi & Animated Trees gain Area +1. 4+. Slimes & Trolls gain Immune Fire. 1. Sneak Attack; the Dungeon gains +4 Power per Attacker. 2. Master Trapper; all Traps in the Dungeon gain Area +1. 3. More Than You Bargained For; draw another Dungeon card for this encounter. 4+. No Rest; place a Wound token on target Adventurer. This is a fun little side adventure so you can get some extra use out of your Dungeon Crawler collection. You must understand how to play Dungeon Crawler Solitaire before you begin play (Rules can be found here). Just like a choose your own adventure, there are several outcomes. Build an 80 card Crawler deck, select your Adventurers and make your way through a gauntlet of scenarios to complete the adventure! Keep your Dungeon cards handy to reference their stats. Once you have your deck created and your Adventurers have been selected, click on the image below to begin! One exception to the rules; during Encounters, when there are no more Attackers remaining in Play, clear cards. In the case of cards that Restock Dungeon cards (like Delay Inevitable) treat the Restocked cards as the only cards in the Dungeon deck. 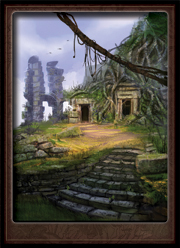 If there is a Dungeon card available to be Pulled in to Play from the "deck" the encounter continues.